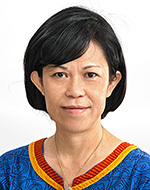 Adrienne Mak, a Malaysian Chinese, has been a national of Taiwan since 1992. She joined AVRDC as secretary to the Deputy Director General in 1990. In 1993, she moved to the Director General’s Office and became the executive assistant to the Director General in 2006. In 2010 she was promoted as Manager – Management Support and HR Services. She has extensive experience in administration, office management, and corporate relationship activities. She manages the Director General’s Office, coordinates the work of secretaries supporting the management team, and provides human resources services to the international staff based at the Center’s locations in different parts of the world. She also acts as secretary for the Institutional Management Committee, Green@AVRDC Committee, and the Assets Committee.